Reveals the Divine Plan for the human race beginning with creation and climaxing in a great restoration when justice equity and peace will be the portion of all who dwell upon the earth. The Bible has ever been subject to attack by pagans atheists and agnostics but not until these modern times have questions concerning its validity been entertained by those who profess to proclaim its message. About the middle of the nineteenth century the school of higher criticism came into being and its adherents made militant advances in discrediting the Divine Revelation of the Scriptures. The books of the Pentateuch attributed to Moses...especially the Book of Genesis...were selected for their primary assault for it was perceived that if faith in these records could be shaken the foundation upon which the story the Bible tells rests would be completely undermined. The aim of Primogenesis is to meet and defeat the subversion and disbelief within the Christian fold. Particular emphasis in this book is placed upon the accuracy of the account of creation the certainty of the authorship of Moses of the books he wrote and the correctness of the account that follows his records. And Rand accomplishes his purpose by showing that the earlier books of the Bible are basically a study in origins and all the essential background they provide is presented here in an easily-read style. As the story is told it will heighten your interest in the Bible and increase your knowledge of the great drama of the ages unfolded in its pages. 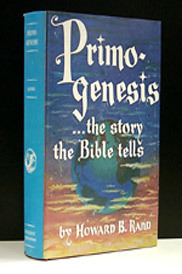 Primogenesis is a verse-by-verse exposition of the Bible story from the beginning covering the five books of the Pentateuch then through the division of the kingdoms to the commencement of the Great Captivities. It embraces the fascinating account of creation the beginning of human history the rise of civilizations the organization of the Kingdom of God on earth and its subsequent history during the successive stages of its growth in preparation for its future destiny and greatness. Sixteen Valuable Charts: A feature that sets Primogenesis apart from other books is the section devoted to genealogical charts from which much information may be obtained concerning the origin of races and lines of genealogical descent among peoples. These charts will be found of special assistance in tracing the ancestors of the People of the Book and will also help to identify the people and races associated with them. Index of Scriptural Texts: By consulting this section the chapters dealing with specific Bible statements may be located at once. This will enhance the value of this volume for those engaged in Bible research and as a textbook for students and teachers in Bible classes and discussion groups. Concordance: Key words familiar phrases and the special topics dealt with are arranged in alphabetical order in this section. Thus you will be able to easily find the subject matter you are looking for. The author does a masterful job of accomplishing what he set out to do in proving the veracity of these books to anyone willing to look at all the facts presented with an open mind.